Day 6 Carihuela - Caballo and home! 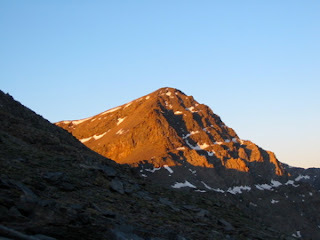 We were up at first light; I had not had the best nights sleep - the Cabra de Montes which were particularly friendly had been walking over the stone roof of the refuge, keeping me awake. Fortunately the cloud had cleared, and we were soon packed and ready to leave. 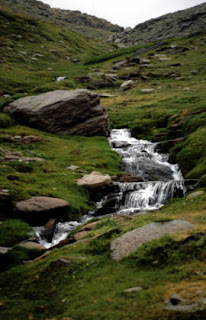 Our route took us past the upper reaches of the ski resort, to the Lagunilles de la Virgen, to fill water bottles and then followed a well made path through the Tajos de la Virgen towards the head of the Rio Lanjaron. We had really enjoyed walking this path the previous year, it has been constructed through the boulders and steep slopes below the ridge, and can be followed almost all the way to Lanjaron. 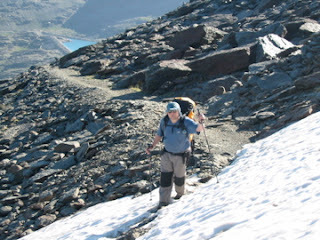 After just over an hour, we reached the col below the Elorrieta refuge. 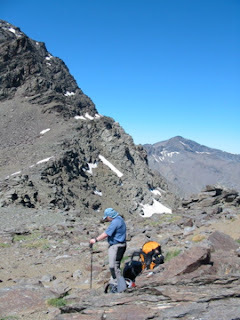 We had decided to stay on high ground, and follow the ridge path towards the summit of Caballo. Our first challenge was to reach the summit of Tosal del Cartujo (3,152 m). This looked relatively straight forward, and we had already walked the route in reverse, however the path was not obvious, and our way involved quite a bit of scrambling (and scrabbling on my part!) to gain the high ground. We were rewarded with great views back toward Veleta and enjoyed a short break before once again becoming concerned at the encroaching dark cloud. The ridge path proved to be much more challenging than the Verea cortá, which winds its way very enjoyably beneath the summit ridge. However our task was to stay up high, and we managed to negotiate the rough ground, loss of path and inevitable boulders to reach the col beneath Caballo (3,005, 7, 9 or 11 metres depending on which map you look at!) just after mid-day. Here we debated where to go next. Our plan had been to leave our packs, climb to the summit of Caballo, then drop down to the refuge for a leisurely afternoon. However the cloud was looking more and more menacing, and neither of us could see the attraction of sitting at the hut engulfed in cold and mist, so we decided to press on. We reached the summit to enjoy the last of the sun, then made a hasty retreat to a more sheltered spot for lunch. Home seemed so near, yet so far. Our finca is at 1,300m on the slopes of Caballo - 1700m of descent! Following the familiar ridge path was easy enough; we have done it lots of times before and enjoyed the wild flowers and changes of vegetation. The route we have perfected takes us down a fire-break rather than the long and tedious mountain road, but is particularly hard on the knees. After the first half hour, I was really finding the pounding difficult, even with the use of poles. However we did marvel at the way the vegetation was beginning to regenerate after the fire 2 years earlier, the hillside had turned yellow, with an amazing variety of plants, and the fire-break itself was becoming overgrown with pine saplings - all very good news. We made it to our house by the early evening - very tired, relieved to have got back safely and already re-living the experiences. A very welcome cold beer was waiting in the fridge and showers made us feel at least half human again. 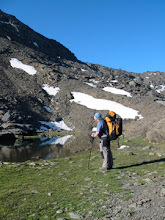 We lingered at Siete Lagunas, taking photo's and enjoying the atmosphere, both wondering if we should spend another night there and make an attempt on Alcazaba. In the end we decided to press on, and began our ascent out of the valley towards the summit of Mulhacén. We had climbed Spain's highest mountain a number of times; although not a technical peak, it does demand some effort and the weather can change very quickly. Out last visit had been the previous September when the upper slopes had a thin covering of snow and ice. This time there was still the odd snow patch, and the cloud, which was blowing in earlier each day, was looking ominous even as we began, helped us to stay relatively cool. The route from Siete Lagunas is probably the nicest of the three options, with an obvious path most of the way, and great views of the 7 lakes below. As we reached the top, the sun emerged, although the valley to the north was filled with cloud. As we scaled the summit boulder to the trig point, we noticed a new plaque had been added to the shrine in memory of 3 walkers from Northern England who had died on the mountain in March 2006. Leaving the summit the path down to Caldera takes the steep path to the right. Once again, I appreciated having poles, but despite this found my knees aching by the time we reached the road. Until fairly recently, it was possible to drive from Granada to Capileira, using this amazing high mountain road. It is now frequently strewn with boulders, and must have been quite a frightening trip. Caldera is a wide bowl, gouged out by ice, containing a small lake and mountain refuge. We stopped at the refuge for lunch, where we met 3 British walkers who had been planning a trip similar to our own, but been thwarted by the Alberque at La Ragua being closed, and that day had walked over from the ski resort. We shared mountaineering experiences over our bread and sausage, before continuing along the road. A short way on, rounding a bend we noticed a building on our left, and decided to investigate. It turned out to be another small refuge, which we had not seen the previous year, though it clearly had been there and was marked on the map! 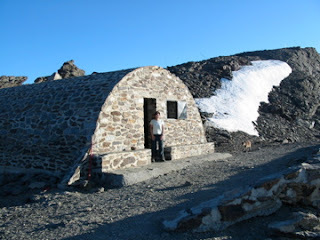 The Sierra Nevada had once had numerous small rounded unwardened huts, providing shelter for walkers and climbers, however many of these have fallen into disrepair. This one (described as a refugio forestal on the map) was more in the style of a Alpujarran cortijo, with a flat roof. For the rest of the afternoon, we followed the road, with the cloud billowing around us, and arrived at the Carihuela refuge around 3.30. Our intention had been to have a snack, then head for the summit of Veleta, which at 3,396 is the second highest mountain in the range. Veleta, sometimes been described as the highest cycle track in Europe has a road leading almost to the summit, and was often considered to be higher than Mulhacén (3,482), as this is how it appears from Granada. Today, the cloud and cold meant we would have had no view, and the thought of a toil up a road, was not at all appealing, so we filled our water bottles from melting snow, made another drink and sat in the hut reading until the 3 British doctors we had met earlier appeared to relive their tales of climbing Mulhacén. We woke early, the snow had frozen hard overnight, making melting it for morning drinks quite a chore. While waiting for the water to boil, we watched the sun gradually rising over the peaks, quite spectacular. From our campsite, a small path led through a boulder field then climbed steeply onto the ridge, stepping into the warming sunshine as we reached the col. From here numerous paths climb the slope towards the summit of the Puntal de Vacares. (3,066 m). We more or less followed the edge of the ridge, the path, though narrow and loose at times, was as we made for the rocky summit. We stopped to rest and get our bearings on a broad rock ledge just below the top, and leaving the sacs, made our summit bid! The route westward from the summit of the Vacares is probably the most complicated of the trip, and is often obscured by snow patches (as in our case). 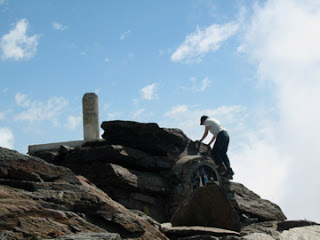 We descended through the boulder field for a short way, then made for a Pinnacle 50m east of the summit of the Puntal de El Goterón, which seemed an obvious landmark. This was eventually reached, and led us to another rock ledge and then back onto the ridge for a pleasant descent to the col below Alcazaba. Here we had our usual mid morning snack, gazing longingly at the rocky route on the steep north side of Alcazaba. There were still significant snow patches covering the path, and neither of us wanted to take any chances with big packs and no ice-axes, so we decided on the southern route, of the beautiful valley of the Rio Goterón. Wandering down the Tajos del Goterón, with it's laguna, we picked our way round the majestic waterfall to the stream, past patches of gentian and other early flowers, to the stream, which was to be our lunch spot. After an enjoyable break, we headed off towards the Loma de la Alcazaba and Siete Lagunas. The path out of the valley, though steep, again proved much easier than we had remembered, and we followed it towards the junction with the Alcazaba ascent route. As we did so, the afternoon mist was once again drawing in and we soon found our view both below and onward completely obscured. We found ourselves following horse tracks, hoping they were going in the right direction, until crossing a rocky section, they disappeared. We got map and compass out and took a bearing. Using the directions for adjusting magnetic variation on the Spanish map (using 1950's map datum) seemed straight forward until we found the bearing taking us downhill; we were convinced we should still be ascending! Jane got out her GPS - she had so far been using it occasionally to mark significant way-points, but had expected to need it for anything else. Having established we knew where we were, the compass was still way off (around 30 degrees), we asked the GPS to take us towards Siete Lagunas, and it very obligingly did so! Of course there were a few deviations on the way, but we managed to pick up the horse trail again and crossed the wonderful borreguiles above Prado Llano before eventually rounding the Loma de Culo Perro and Siete Lagunas, our camp for the night. 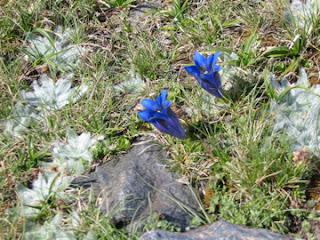 A jusifiably popular camp site, the ground around Siete Lagunas was carpeted with gentian and Esterella de las Nieves (star of the snow). We spent a relaxing hour before supper, taking photo's and enjoying the beauty of the surroundings. Still amazed that our fellow campers were the first people we had encountered for over 48 hours. By morning, the horses had moved away, and we were able to enjoy our breakfast undisturbed. I was conscious that we had now completed what I had originally (though in hindsight wrongly) thought would be the easier part of the walk, and the next section potentially had some of the more technical stretches of the ridge. 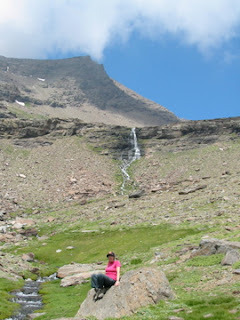 On previous occasions, we had found the walk up to Los Ladrones (2,900m) quite hard work. Puerto de Trevelez is a crossing point for old mountain trails and often visited by walkers, however again we saw no-one, and found the early morning walk (taking less than an hour) surprisingly pleasant - are we getting fitter? After a photo break we headed on towards Puntal de Juntillas, our first 3000m peak. From here there are really good views of Mulhacen and much of the ridge we would walk that day. Beneath us and to the north, 2 walkers were decending from Picon de Jerez, the only people we saw all day. We wondered where they had started to have arrived there so early? From here we decended a short way before tackling the horseshoe of Puntal de los Cuartos and Pico de la Justicia. Although it required a little more concentration, overall the route was not difficult. From the summit of Juntillas, we picked a way onto Cerro Pelao (3,181 m). From here we had great views down into the bowl of the Laguna de Juntillas, where we had camped the previous year. 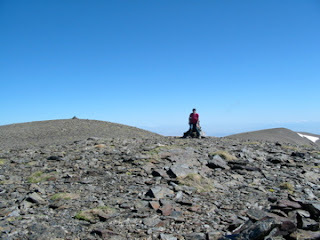 This was followed by the rocky environment of the Tajos Negros to reach the high point of Puntal de Los Cuartos (3,158m). Unfortunately the route absorbed my concentration, and I found I hadn't taken any photo's. Other intrepid 'integrallers' have however helped me out. We descended to the collado de las Buiteras for lunch, by which time for the first time on the trip, the cloud was beginning to pile in. We wondered whether this was going to herald a storm, and debated sitting it out on the col (not the wisest place to be in stormy weather, but better then a summit), however in the end, decided to press on. The path to Pico del Cuervo (3,144 m) takes you through quite a complicated boulder field, and proved difficult to follow from the col. However it has a large cairn at the summit and once again great views, despite the cool cloudy weather. On our previous trip, we had found the descent towards Vacares quite difficult, so decided to stay on the northern side of the ridge. This proved to be a little easier, but not without it's route finding difficulties, again involving some steep rocky steps and a boulder field. However by 4pm we had made it down to our campsite underneath the northern slopes of the Collado de Vacares. There was no running water here, but still big snow patches, so snow melting was the order of the day. We filled our pan and kettle with snow and set to to make drinks and enough water for the evening meal. We shared the camp with 6 sheep and amazingly a young lamb; some had bells, and I had visions of another disturbed night, however they proved entertaining companions and eventually left us, presumably for a less exposed setting. This was our highest campsite yet, and just beneath the snow, it soon turned cold. As we watched the sun going down behind the hills, we tried to pick out landmarks in the Rio Genil far below. We turned in before dark, a shame in many ways, and one of the drawbacks of having a tent, it just felt too cold to be out, but would have been a great night for watching the stars - maybe next time we should just bivi? Monday morning dawned bright and clear. We really ought to have had an 'alpine style' start, striking camp just before dawn and reaching the summit of San Juan as the sun was rising. However we were on holiday, and neither of us had the energy for cold early morning starts. Our shepherd friend had been right about the cold, although this it is Southern Spain, the temperature does drop overnight even in the height of summer, but of course as soon as the sun comes over the horizon it sheds its warming rays very quickly - not conducive to steep uphill walking with big packs. After a breakfast of hot oats and coffee, we refilled the water bottles and set off. The eastern slope of San Juan had looked rather daunting, as we had descended to the col the previous evening, and we were not really looking forward to tackling it! However it's bark proved much worse than it's bite, and steady walking with a few short breaks soon saw us at the summit and enjoying the morning flapjack snack we had promised ourselves. At the summit (2786m), the remains of candles suggested we had followed in the steps of pilgrims who had we assumed walked to the summit to celebrate San Juan the previous weekend. An hour or so on, at Piedras de Pelegrina, we found ourselves walking through a herd of cows. I am quite taken with the way cows appear to thrive in the Sierra Nevada. Despite the altitude, they look much healthier than their British counterparts, and are not threatened by walkers. Just before Penon del Puerto (2754m), we saw a second shepherd and wondered if he was their owner. Again he made a point of approaching us and asking where we had come from. 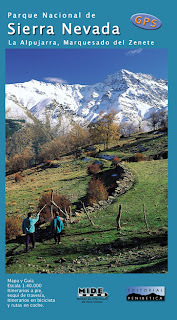 He thought we were very hardy, having walked from La Ragua. I commented on the difference from farmers in the UK, who would more often than not want to avoid walkers, seeing them as a nuisance when approaching stock, rather than fellow travellers to share experiences and the time of day with. Soon after we found a good lunch and rest stop amongst the rocks of Penon del Puerto. We have discovered the delights of dry cured sausage, olives, Spanish dried breads, 'squeezy' cheese and a fruit and nut mix, as a nutritious and relatively light to carry lunch. With a few minor variations, this was our lunch most days on the trip. We soon headed off again following the rise and fall of the ridge. Mike had looked at the map, assuming that it was only an hour or so to our proposed campsite, but became extremely dismayed to discover we had 4 peaks and a long ridge to tackle that afternoon; we needed to head on! 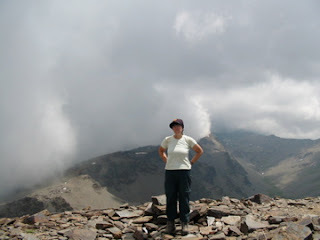 A steep climb led us to the summit of Puerto de Jerez (2919m) and then on to Cerro de Trevelez (2877m). Despite a few paths heading up from the valleys of the Alpujarra, the mountains had an increasingly remote feel, and we met no-one else until arriving at the popular camp site of Siete Lagunas the following day. 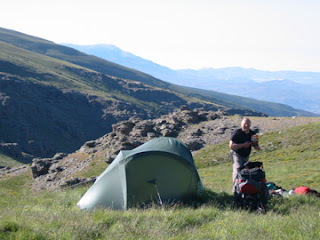 Our second night was spent at the head of the Rio Trevelez (2780m), a place which we had visited twice the previous summer and thought would make a really good camp site. This proved to be the case; we found a soft flat spot, with lots of rocky boulders to use for our camp kitchen. We were really close to two springs, with lots of water and flowers. The stream stretched down the valley to Spain's highest village far below and nearer to hand we saw what we took to be cows. As darkness fell, and we zipped up the tent, we began to hear the tell tale sound of bells, getting gradually louder. Cows do wear bells in the Spanish mountains, however somehow these creatures didn't sound like cows. Eventually Mike put his head out of the tent, to find us surrounded by horses, both young and old. Though I certainly wouldn't describe myself as a 'horsey person', I normally don't dislike horses, however somehow a lot of the creatures so close at hand, and in the dark, felt quite threatening, so not the best of nights sleep! north and Laroles to the south, and promotes itself as a venue for cross country skiing. When we had visited earlier in the year there was very little snow, but the pleasant restaurant was open and skis could be hired. Today only the tourist information centre was open, so we decided to set off and take the first day as it came. Our first task was to fill water bottles. Fortunately a stream runs past La Ragua north towards the valley, and in June this was flowing very nicely. With full bottles and bladders (we carried 5 litres of water between us at the start of each day) we set off. Our route took us through along the stream and skirted the forest before opening out onto the slopes of Moron de la Cabanuela, where we stopped for some lunch before losing the last of the shade. The afternoon saw us reaching our first summit, with great views of the ridge ahead. we found the mountains at this end of the ridge to be much more grassy than I had expected, and although it should have been easy walking, the 'ups and downs' were in fact really quite tiring. That afternoon we climbed 3 further peaks, Hornillo (2375), Sanjuanero, and Mediodia. From the latter we could see signs of water in the Rio Nechite (marked as a fuente on the 1:50000 map). This was our target for the first nights camp. However the slopes of Collade del Realejo Alto proved much longer than appeared from the distance and it was a very tired pair who found themselves turning left at Puerto del lobo to head down a well marked track. Unfortunately our water source proved somewhat allusive. The first two green strips we had seen in the distance turned out to be dry. We stopped for a short while to watch a herd of goats browsing on the short grass, and after a few minutes were joined by their owner, who asked what we were doing. I asked him about water, and he advised that there was water further down the valley, and would take us. However it seemed that this was going to be another couple of kilometres away, and neither of us were keen on losing that much height. I had found a small spring not far away, and we decided to make the best of this. We will stay here I said to the shepherd; it will be cold was his response! No, we have a tent & sleeping bags, OK, have a good night - he clearly thought we were either very foolish or totally mad! It turned out to be a quite acceptable camp site, and we soon had the tent up and a bowl of pasta on the boil. Relaxing the end of our first day accompanied by the distant sounds of the goat bells, we mused on the fact that we had seen only 2 people since leaving Ragua - a student looking for Vipers and the goat-herd; this truly was wilderness country! Planning for the trip had needed careful thought about the route, distance we could manage each day, considering the terrain, altitude and likely weather. One of the most important issues when walking in southern Spain is the lack of water, even in June. We already knew that we would have to carry all of our food, but should we also carry a tent or just bivvi - after all this was mid summer in hot dry Spain! 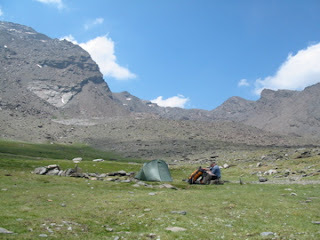 Previously when trekking in the Sierra Nevada, we had experience of both bivving and camping. However those who had been with us on earlier trips convinced us that the extra weight of a tent was worth it for a better nights sleep. In addition to the tent, sleeping bags and mats, other vital gear included our pocket rocket stove (ideal for 2, but not so good for larger groups) pan, 2 gas cannisters, sterilising tablets for water and first aid kit. These plus our food some evening reading material and a change of clothes meant quite big sacs. I debated with myself about the need for that 'nice to have' electronic gadgets. We carry a digital camera bought in 2002 and now bigger than many more recent models. We both enjoy peering through our cheap binoculars and I sometimes carry my Garmin GPS, but this too is quite heavy and bulky. In the end we went for the camera and GPS - the latter just in case, and anyway I quite enjoy playing with it! Last but by no means least, a map. over the past 5 years I have collected just about every map available of the Sierra Nevada and Alpujarra. None are very good or very accurate, but my personal preference remains those produced by Editorial Penibetica, we used the latest 1:40000 of the Sierra Nevada published in 2005 which comes with a brief guide to the area and GPS data in English and Spanish. It can be obtained by post from Maps Worldwide. The final elelement of our planning involved getting to the start! Our mountain finca on the slopes of Caballo above Lanjaron is some 60 km away from the proposed start point of Puerto de la Ragua. We thought about using public transport, but after a brief visit over the winter, realised that this would prove more difficult that we had first thought. Although there is a road over the mountains linking Laroles in the Alpujarra with la Ragua, this more obvious route to the south is time consuming. In the end we decided to opt for an 'informal taxi', a number of which are being offered by British people living in the area, and provding an English language alternative to the local firm (we were not sure we would be able to explain our rather crazy notion to a Spanish driver with our still limited language skills!). To make the arrangements we telephoned Pam from our home in the UK, who had put a notice in one of the shops in Orgiva, but she was busy that day. She suggested a friend called Sharon. Unfortunately when we called Sharon there was no answer - is this going to work we wondered? However 5 minutes later we received a call - did you just ring me the person asked? In fact it was Mike who had rung, and I was thrown just a little. We were wanting a lift to La Ragua I said - do you know where that is? She, somewhat surprised said yes, I've been there once, but it will take a while. After a bit more explaining, the arrangements were made, a price agreed, and there was now no going back!